You're probably sick of hearing Samsung-this, Samsung-that, but the reality of the matter is that the company has grandiose plans to take over the gadget world, and there’s no slowing it down. At the Tizen Developer’s Conference, I got a glimpse into what Samsung’s next venture is: growing its own open-source operating system so that it might someday be able to break free from Google’s shackles. It’s a lofty goal for a company that just won’t stop with that grimace-inducing blue aesthetic, but alas, that exists in Tizen OS, too. 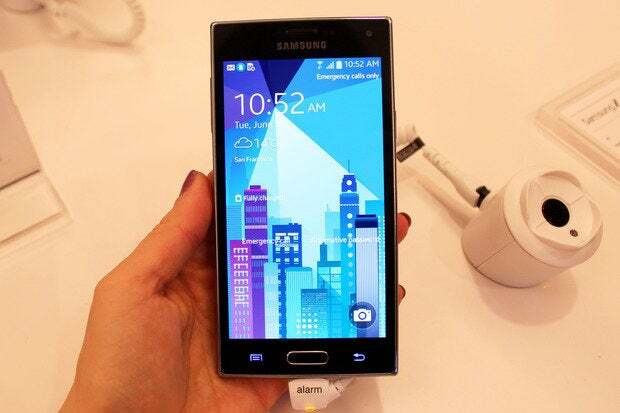 Here’s a look at Samsung’s implementation of its OS on a smartphone, the Samsung Z. The Samsung Z runs Tizen, an open-source operating system that’s based on Linux. You know, like Android. The phone itself is a gorgeous piece of hardware. A Samsung representative mentioned that its rectangular design was conjured up specifically for the Russian market, where the phone is debuting this year. It's a darn shame, too, because it'd be great to have something like this show up in the American market. The Z’s navigational buttons mirror those on the Samsung’s Galaxy devices; they fade in and out, too. The Z also features a bright and vibrant 4.9-inch HD Super AMOLED display, a quad-core 2.3GHZ processor, 2GB of RAM, 16GB of storage, and an 8-megapixel front-facing camera. Oh, and I almost forgot: it also features the same fingerprint scanner and heart rate monitor as the Galaxy S5. Tizen OS is based on the Linux Kernel, while apps are coded using WebKit and HTML5. Samsung touted that this particular iteration of Tizen had been optimized to utilize 20 percent less memory than previous versions. I was impressed with the way games ran on the OS, but it likely helps that the device is running a quad-core, Qualcomm-manufactured processor (a Samsung rep could not confirm which SoC is inside, but added that it does have an Adreno 330 GPU). There was a bit of stuttering as a few of the games started up, almost as if they were buffering, but the end result was smooth. The Samsung Z looks and feels like every other Android-powered smartphone Samsung has on the market. It runs the Tizen OS, but you wouldn’t be able to tell by simply looking at it. Many of its interface elements, including certain actions and gestures, mirror the version of TouchWiz loaded onto the Galaxy S5. It even comes loaded with the same suite of Samsung-branded apps. Both the Quick Settings and Notifications shade are modeled after Samsung’s versions of Android. They’re just as customizable, too, though they appear to be a bit more static. I didn’t get any notifications while I was using the display phone, so I was unable to test if they were adaptive or interactive like those in Android (and soon, iOS 8). The Application Drawer also resembles Android’s, though it functions a bit differently. The eight icons you see on top in the photo above stay fixated as you’re perusing through apps on the bottom portion; normally, they stay docked into the “Favorite apps” section at the bottom of the Home screen. Since TouchWiz and Tizen don’t look remarkably different, you should have no problem adopting one over the other—right? It’s obvious that this incarnation of Tizen is Samsung’s way of establishing its own brand in the mobile world, outside of the Android sphere. I can see this as the veritable beginning of Samsung’s attempt to truly distance itself from Google. As mentioned, Samsung will sell the Z in Russia, and then evaluate its performance before it brings it to other markets. The Tizen Store will also run a special promotional program to entice developers to make apps for its new ecosystem. If this catches on, it could spell the beginning of the end of Samsung piggybacking on Android.